I know everyone is shocked to see this and that I’m going against conventional wisdom and perhaps all logic, but I’ve been wavering back and forth among the top 3 and decided to go by my original gut instinct and lean toward the horse with the most impressive performance I saw all year by a 2-year-old. Plus, we Brooklyn boys have to stick together and how can I not lean toward 1950s Brooklynites named Vinnie and Anthony? Co-owner Vinnie Viola says he's "putting on weight and growing like a weed." In his last work, he went out an eighth past the wire in :11 2/5. It might not seem to be the wisest thing to do to go with Dominick Schettino over future Hall of Famers Dale Romans and Kiaran McLaughlin, who I believe are both are sitting on a Derby victory and are armed with extremely talented horses. Schettino, on the other hand, had not won a graded stakes before the Champagne in 21 years and his only black type winners since 1994 have been mainly a handful of New York-breds. But then I think of names like Chip Wooley, John Servis, Michael Matz, Cam Gambolati, Don Combs, and even Art Sherman, who were not exactly household names. And you don’t normally associate Schettino with a $575,000 regally bred yearling like this. So, let’s give him the benefit of the doubt and see what he can accomplish with a horse of this caliber. He has been training on the New York circuit for over two decades and hasn’t filed for unemployment yet as far as I know. And the belief here is that this is a gifted colt, who just glided over the sloppy track to blow away his rivals in the Champagne under a hand ride, in which the runner-up came back to finish a gutsy second, beaten a neck, in the Delta Jackpot. He apparently had a legitimate excuse in the BC Juvenile, returning with an ulcerated eye after likely getting hit with a clod of dirt and had to be treated with antibiotics. So that was a throw-out race, even though he had to go about 9-wide turning for home, ducked in sharply, losing momentum, and still was running strongly at the end, beaten only 4 1/4 lengths and two lengths for third. I also loved his maiden score, out-closing a good horse in Pirellone, while going three-fifths faster than the other division won by the talented Rafting. I originally was going to rank him No. 1, but although I stuck it out with American Pharoah last year because of his superstar qualities, I wasn’t prepared to sit on this colt for two more months before his debut in the Tampa Bay Derby March 12. And until Monday he hadn’t worked in 3 months. But he did pop up on the work tab Monday morning and obviously has retained his sharpness, breezing a half in :47 2/5 to make things more complicated at the last minute. At this point I’m willing to consider him and Greenpointcrusader as 1 and 1A. If he returns the same horse as last year, he could very well move to the top. If you believe in the Derby gods, they have to give it to Dale Romans one of these years. No one is more worthy, and what better year than this, with a classy horse like Brody’s Cause, who has the running style, the turn of foot, a strong, relentless stretch kick, and the pedigree. He looks to be the complete package. He turned in a powerhouse performance in the Breeders’ Futurity, coming home his final sixteenth in under :06 despite the short stretch, and then running down a very good horse in Exaggerator. Don’t hold his third in the Breeders’ Cup Juvenile against him, as he was in traffic most of the way, eased out between horses, and was very late changing leads. But he found his best stride and was coming fast at the end to get third. Like in the Breeders’ Futurity, the finish line was located at the sixteenth pole, which compromised his running style. Romans overall has done very well in the Derby, finishing third with two grass horses and fourth with a speed horse. And this colt appears to be everything you look for in a Derby horse. Following stablemate Cherry Wine’s second straight explosive score recently, this time in a Gulfstream allowance, you have to wonder if Brody’s Cause is even the best horse in his own barn. But right now, Brody has a big class edge on Cherry Wine. Yes, I admit he is a logical choice for No. 1, being undefeated and showing uncanny professionalism in all his races. He’s not going to blow you away, but I loved the way he rated down on the inside in the Remsen and then split horses after turning for home. And then Flexibility, who he defeated in the Nashua and Remsen, flattered him in the Jerome with an impressive victory. McLaughlin appears to be sitting on a Derby victory and, like Dale Romans, should be high on the Derby gods’ list. Watch this colt being sold on YouTube. I’ve never seen a horse stand so still for so long. It looked like he was falling asleep as his price rocketed to $2.2 million. The only parts of him that moved were his ears. So why isn't he No. 1? 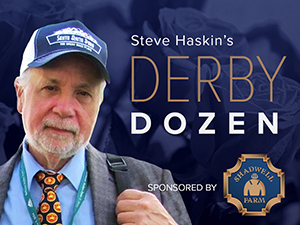 I honestly can’t give any concrete reasons other than he looks too obvious, and it must be mentioned that no Remsen winner has won the Derby in the past 22 years. In fact, in those 22 years only one Remsen winner has even placed in the Derby. Although the Remsen gives a horse a great of bottom and gives a trainer a lot of leeway at 3, perhaps 1 1/8 miles is simply too far for a 2-year-old, especially in only his third start, and has a tendency to dull them, considering the slow times the Remsen usually produces. I would have liked him a lot more had he debuted in a sprint to sharpen him up. But to his credit, his time was almost three full seconds faster than the Demoiselle on the same card. Overall, I was very impressed with his performance, and in the Nashua Stakes as well, and it was tough not putting him first. In numerology, the keyword for the name Mohaymen is reliability and the qualities are dependability and stability. That’s him. And the name Mohaymen’s colors are gray and blue, and he’s gray and his silks are blue. Hey, it’s the Derby, we can go a little crazy right off the bat. Many will consider it a snub ranking the undefeated 2-year-old champion and three-time grade I winner in fourth, but although I am not of the opinion he is distance limited, I do have to wonder if he will be as effective at a mile and a quarter. Right now, he is a winning machine, but his perpetual bridesmaid, Swipe, has gotten closer to him in each of his four second-place finishes, and his 5 1/4-length score in the Best Pal has been whittled down to a half-length (in the BC Juvenile). And Swipe, who currently is on the shelf, looks more distance-oriented. Nyquist also benefited from the very short stretch run at Keeneland, even though he had a wide trip most of the way. When I had heard that he would make his debut in the 7f San Vicente, I loved it. That would give him a good sharpener after a pair of two-turn races. But then when it was announced he would have only one more start, the Florida Derby, I didn’t love it as much. I don’t feel one sprint and one two-turn race is enough to have him ready to go 1 1/4 miles, especially with a five-week layoff to the Kentucky Derby. But that’s old-school me. If the Santa Anita track is hampered by the weather, he could go up to Golden Gate to train and debut, and that’s a totally different story, as it would give him two route races, although he wouldn’t be facing much up north (his stablemate, who is not in his league, just won the California Derby). You have to admire this colt’s consistency and will to win. He is a deserving champion. But where he’ll be on the first Saturday in May and how he’ll stack up against these horses we’ll have to wait and see. Now this colt making his debut in the 7f San Vicente is perfect, as he’s already made six starts, three of them at 1 1/16 miles, so he definitely would benefit from a good sharpener in a sprint to start off his campaign, just as Desormeaux did with Texas Red last year. He’s run well from 5 furlongs to 1 1/16 miles, winning stakes sprinting and around two turns, on fast and muddy tracks, and is as honest a colt as we’ve seen. In his two-turn debut, he looked to have the Breeders’ Futurity won until Brody’s Cause came from the clouds to run by him late, and in the Delta Jackpot, he ran a gutsy race to hold off Sunny Ridge the length of the stretch, and Sunny Ridge was coming off a second in the Champagne Stakes and an authoritative victory in the one-mile Sapling Stakes at Monmouth. In the BC Juvenile, he was jostled around in heavy traffic early, was stuck on the rail the whole way with nowhere to run, and finally got a clear run at the top of the stretch, but had to ease out for room after running up behind a wall of horses. Once clear again, he found his best stride and was coming on at the end only to get nipped for third by Brody’s Cause. Casse has developed into one of North America’s elite trainers and he also has a strong Derby contender in Conquest Big E. This colt remains a bit of an enigma, as he still has never run over a fast dirt track, although he was quite impressive in the Ky. Jockey Club Stakes, run over a sloppy track, and the runner-up in that race, Mor Spirit, came back to win the Los Alamitos Futurity and the third-place finisher, Mo Tom, won Saturday’s LeComte Stakes impressively. And he opened up on both of them. Being inbred to In Reality certainly helped his wet track form. His broodmare sire, Cuvee, is not exactly what you’d look for in a stamina influence, but there is plenty in his female family to suggest he’ll get a distance of ground. What helps make the Casse operation so potent is Mark’s son and assistant Norman, a talented horseman in his own right who will one day be a top trainer himself. The jury is still out on this colt, but he was born on my wife’s birthday, so I’ll give him the benefit of the doubt. No nasty comments, please, I’m joking. Bottom line is he could be any kind if he can duplicate his form on a fast track, so we’ll take a wait-and-see attitude for now. Solid, steady performer who looks more like a one-paced grinder that keeps coming at you, from either close up or farther back. He runs with his head low and showed his class finishing second in the Ky. Jockey Club Stakes after pressing the pace, taking the lead on the far turn, and then digging in gamely and holding off the challenge of Gun Runner, while never seeing the winner Airoforce rolling down the middle of the track. He kept battling on and never gave up, holding on for second over a fast-closing Mo Tom. He then came back in the Los Alamitos Futurity, settling farther back in the pack this time and then making steady progress to run down his stablemate Toews on Ice to win going away. But Toews on Ice came back with a poor effort in the Smarty Jones Stakes at Oaklawn as the 3-5 favorite, tiring badly after setting the pace. Mor Spirit is another of the many consistent young horses we have on the Derby trail this year and he’s always going to be right there fighting to the end. For Baffert, after last year there is zero pressure on him and he can just enjoy this year’s Derby trail. It’s all icing on the proverbial cake. Baffert was quoted as saying he’s hungrier than ever after last year’s Triple Crown. That’s like eating three 48-ounce porterhouse steak dinners at Peter Luger’s and saying you’re still hungry. It was mentioned earlier that only one Remsen winner in the past 22 years has even placed in the Kentucky Derby, and that was this colt’s sire, Bluegrass Cat, who finished second to Barbaro at Churchill Downs. It’s the same old story; if you like Mohaymen you have to like Flexibility following his two gallant second-place finishes in the Nashua and Remsen, and then starting off 2016 with an impressive score in Aqueduct’s Jerome Stakes; granted against far less talented opponents than Mohaymen and having the perfect setup. But the bottom line is he won, and now it’s a question of whether debuting on New Year’s weekend was too soon after having a tough nine-furlong race only a month earlier. Let’s see what Brown does with him now. He probably could use a little time off before gearing up for the Derby. It would be difficult having him peak on the first Saturday in May if he keeps racing steadily through the winter and early spring, having already had a tough race at 1 1/8 miles. But, like Mohaymen, he is consistent and dependable, and we’ll see what path Brown chooses for him. There are a lot of questions with this colt, but there is also tremendous upside if he answers those questions satisfactorily. First off, he did finish eighth in the Breeders’ Cup Juvenile, but was coming off only a maiden win and was surrounded by traffic for the first three-quarters, pressing the pace, but still was beaten only 4 3/4 lengths, which in many ways isn’t a ringing endorsement for the Juvenile. The other question is whether he is as effective on a fast track as he is on a sloppy track, over which he scored his two victories. Now for the good stuff. In his maiden score at Keeneland, he ran the 1 1/16 miles in 1:44 2/5, while his stablemate, Conquest Windycity, won the other division in just under 1:46 3/5. In his most recent allowance victory at Churchill Downs, he ran the mile in 1:37 3/5. Later on the card, in the 1 1/16-mile Kentucky Jockey Club Stakes, won by his stablemate Airoforce, they went the mile in 1:38 3/5. So, does this boost his credentials or detract from his victorious stablemate? As we mentioned, the form of that race has held up brilliantly so far. He seems very professional and keeps maturing, changing leads on cue, and has a big smooth stride, but does run with his head a bit high. If Conquest Big E is legitimate then you have to love this gelding, perhaps even more, with his monster closing kick. I’m going out on a major limb including him in the Top 12, as he’s entered in an Oaklawn allowance race Jan. 21, so his stay on here will either be the shortest ever or it could be the beginning of a long association. His first start at seven furlongs had to be seen to be believed, coming from some 15 lengths back and swallowing up the entire field with a powerful burst of speed in the stretch and drawing away to win by four lengths. He then went up against the more experienced Conquest Big E in the aforementioned Churchill allowance and again put in a huge run to finish second, beaten two lengths, while coming home his last quarter in :24 3/5 and finishing 6 1/4 lengths ahead of the third horse in time that equates to about a full second faster than the Ky. Jockey Club Stakes, which was the following race. Although he recently breezed a solid 5f in 1:01, he has missed some training due to the weather, so he may not be 100 percent, and he does have to work on his lead changes, which should improve with maturity. With his pace dependant running style, all I’m looking for is another strong effort to move him a step forward and prepare him for the major races ahead. If he runs poorly, he could take Conquest Big E right off the Top 12 with him. Although he put in strong closing kicks in the Ky. Jockey Club Stakes and LeComte Stakes, the latter was a big step forward because it was a more professional performance. In the Ky. Jockey Club, he had the rail all to himself as he rallied from far back, then in midstretch, jumped over to his left lead under right-hand whipping and ducked in sharply, coming precariously close to hitting the rail, if he indeed did not make contact with it. He recovered beautifully and switched back to his right lead at the sixteenth pole and was closing fast at the end, just missing catching Mor Spirit for second. In the LeComte, he bobbled coming out of the gate, was bumped hard from the inside passing the finish line ad again saved ground. But this time he eased out about 3 to 4-wide at the head of the stretch, then had to angle out to the middle of the track for room and once clear closed strongly to win going away. He’s shown he can win at 6 furlongs and has won at Churchill Downs, taking the Street Sense Stakes, where he soundly defeated Discreetness, who has come back to win the Springboard Mile at Remington Park and today’s Smarty Jones Stakes at Oaklawn. Whatever stamina he has in a bit farther back in his pedigree, but he does have the right running style, so we’ll see what happens when the distances stretch out. Normally I would never have a horse in the Top 12 with only two non-stakes sprint starts in his career and who hasn’t beaten anyone of note, but this one is strictly gut instinct based on the eye test. I never trust lightly raced Todd Pletcher horses like this, who are brilliant in January, but never make an impact on the Triple Crown. But I really like what I’ve seen of this colt, who looks to be as talented as any 3-year-old seen so far. All he has to his credit is a decent maiden score in December and a brilliant 7 1/4-length romp over his stablemate in a 7f allowance/optional claimer. But I can actually see him jumping up and having a major say in the Fountain of Youth and Florida Derby. He has natural speed, but can rate comfortably behind horses, and he possesses the kind of turn of foot you love to see in a young horse. He possesses a big flowing stride and moves over the ground very smoothly. I would have liked to see Sharp Azteca, who finished second to him in his maiden score, come back and run well on Saturday, but he finished a very disappointing fifth at 3-5, so we don’t have that gauge to go by. He now has to take a major leap in class in a short period of time and hustle to make the Derby with no setbacks at all. It’s a longshot, as he’s still a guess, but we’ll see how far his talent can take him. If you’re a believer in the Rasmussen Factor (RF), he is inbred 3x3 to Weekend Surprise through her sons A.P. Indy and Summer Squall. The aforementioned SWIPE, who keeps getting closer to Nyquist with every start, definitely would be prominently placed in the Top 12, even with a 1-for-7 record, but he’s recovering from an ankle chip and trainer Keith Desormeaux said it’s going to be tight making the Derby, although they are hoping to. He should return to training on Feb. 1 and Desormeaux said they are looking for a late March to early April target date for his debut, which would give him only one Derby prep, and obviously that’s way too iffy to have him in the Top 12 right now. We’ll watch his progress carefully. One horse who I like a great deal and had ranked No. 12 before the LeComte is AWESOME SPEED, who looks to have all the tools, has great tactical speed, and is as gutsy as they come. His stakes victories in the James Lewis III at Laurel and Mucho Macho Man at Gulfstream were extremely encouraging, and I love the way he moves over the ground and fights when horses come to him. His pedigree actually suggests more stamina than speed, but he has been able to use his natural speed to win three in a row. Definitely one to watch. CHERRY WINE was mentioned earlier, and if he can duplicate his explosive move against stakes competition then we’re talking about a serious horse. His sire, Paddy O’Prado, was a grass horse who finished third in the Kentucky Derby and his female family appears more geared to a mile to 1 1/8 miles. But again, he has the right running style and puts himself in contention in a hurry and then has the ability to pour it on and demolish his opponents. I’m still high on ANNUAL REPORT, a $600,000 yearling purchase who ran a huge race in the Futurity Stakes in 1:09 4/5 last year and then stretched out to two turns in the Ky. Jockey Club Stakes and ran a solid fifth in the slop. He has a tremendous pedigree and I’m looking for big improvement at 3. He could give Kiaran McLaughlin a solid one-two punch for Shadwell and Godolphin. Two brilliant, but lightly raced colts playing catch-up are DREFONG, trained by Bob Baffert, and SHAGAF, trained by Chad Brown. Both look like incredibly gifted colts with a world of ability. But it’s going to be tight getting them to the Derby. Shagaf does have a 6-length victory at a mile in his debut at 2, so he doesn’t have a lot of stretching out to do. He just needs to get three starts in him before the Derby. Drefong, a 9 1/2-length maiden winner at 6 furlongs in his second career start, needs to show he can stretch out in time. He worked 5f Monday in :59 4/5. Both colts should have plenty of stamina, so that would be an advantage. Baffert finished one-two in the Sham Stakes with COLLECTED and the fast-closing LETS MEET IN RIO, and you can’t dismiss either one, although Lets Meet in Rio looks to be more of a Derby horse. So Baffert has already run 1-2 in stakes races, having swept the exacta in the Los Alamitos Futurity with Mor Spirit and TOEWS ON ICE, who tired badly as the big favorite in the Smarty Jones Stakes. Graham Motion has himself a hot Derby horse in RAFTING, who won the Smooth Air Stakes at a mile at Gulfstream and has been working brilliantly, breezing 6 furlongs in 1:13 flat in his last drill. Following two sub-par efforts on grass, the Ian Wilkes-trained HAND OF POWER woke up big-time at a mile on dirt at Churchill Downs, winning going away with a big move in the stretch and a final quarter in :24 flat. He’s been training steadily at Palm Meadows. If there was a Derby horse to emerge from the Smarty Jones Stakes, it could be third-place finisher SYNCHRONY, a back-to-back winner at Keeneland and Churchill Downs who got stuck on his left lead, while being leaned on down the stretch behind horses. When he finally switched to his right lead at the sixteenth pole he leveled off and was closing well at the end. The winner, DISCREETNESS, has won four of his six career starts and no doubt is a talented horse. It’s just a question of how far he wants to go. Other up and coming Pletcher horses who might have a future are GETTYSBURG, RALLY CRY, STRADIVARI, PROSPECTUS, and DESTIN, who needs to improve off his LeComte fourth. This looks to be a deep crop, and others to keep an eye on are the tough and consistent SUNNY RIDGE, California Derby winner FRANK CONVERSATION, GIFT BOX, COCKED AND LOADED, GUN RUNNER, SAIL AHOY, PIRELLONE, RIKER, UNBRIDLED OUTLAW, AMIS GIZMO, and SEYMOURDINI.